If you go down to the woods today you may be in for a big surprise. Today was another short walk taking advantage of a sunny afternoon and celebrating the plastic bag man‘s birthday. The real reason was a birthday curry buffet at a favourite restaurant, Bangla Spice in Leyland. One of my sons joined us for the laugh, the day before I’d been on the streets of Stretford following a jumble sale trail with my other son and family. Cuerden Valley was our venue having never really explored here before. The area was popular with dog walkers and families all enjoying the space and sunshine. We had a rough map of the park and set off along a path that soon had us crossing the busy M6 motorway, not a peaceful start. But before long we were walking in a strange walled path towards the hall, we imagined the masses walking to work in the past. The hall itself, not an edifying building, was approached. This is the centre for the Sue Ryder Charity. We found in the stables area of the hall several good charity shops – books, brickabat and clothes – all for a good cause, neurological care and support to local people and their loved ones. Onwards past hidden housing estates, the offices for Lancashire Wildlife Trust and a walled garden to the woods where a Gruffalo hunt had been underway. Thankfully this was over and the big G had gone home. Plastic bag man still felt a little uneasy, mouse-like, as we entered the mature woodland. There was a wide range of trees planted by the estate a century ago. Going into an interesting looking nature reserve we were accosted by a volunteer suggesting there was no entry, we didn’t argue [there is always another time to explore unnoticed.] We meekly walked down to the bridge over the River and followed the masses and their dogs. Another carpark was reached and we crossed the road to continue down valley, it was here we got bored and hungry and decided to retrace our steps. What lies down the valley will have to remain for another visit. The whole area is worthy of further exploration. Above us on the return was the new visitors’ centre, an impressive Eco-designed building, which will be worth a visit soon. Further on was the fishing lake, an old lodge. 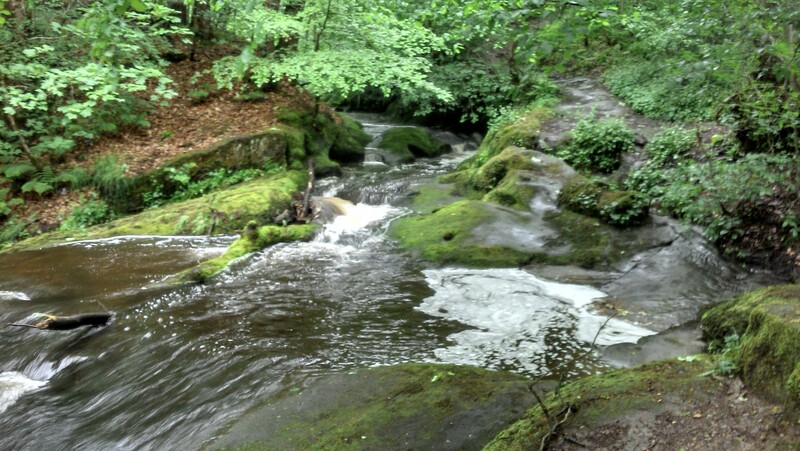 This entry was posted in Family, Lancashire., Walking. and tagged Family, Lancashire, Walking. on September 19, 2017 by bowlandclimber. EASTER DISTRACTIONS ON THE GUILD WHEEL. The garage where I bought my car from last year lies on The Guild Wheel circuit. When I phoned to arrange the yearly service I was surprised the appointment, they have become very clinical in garages, was on Easter Monday, so rather than waste the day in went the bike. The receptionist, very clinical, was taken aback by my Lycra and helmet and doubted I would be back within the 2 hours the service would take. I set off on the Wheel in an anticlockwise direction and after a couple of miles I was investigating the lock gates from the Ribble into Preston docks when a familiar voice caught my ear and there was one of my sons and his partner cycling the opposite way. They were visiting from Manchester and doing a quick circuit before dining with family. I was invited to join them and soon was retracing my ride past the garage I had left a short while ago. I meant to mention that this garage is part of a multi motor showroom complex – there are cars and salesmen everywhere. The day was cool and dry, we made good progress around the northern half of the Wheel. I managed to keep up with their youthful pace but was glad of a coffee stop in, say it quietly, Starbucks. That reminded me of a picture I took in Bethlehem a couple of years ago. Onwards and down through the woods at Redscar where the bluebells were just colouring up. Now the fact it was Easter Monday hit home as all the way through Brockholes the path was thronged with families enjoying the sunshine. Slow progress. The pace quickened on the stretch by the river and after that my companions took a different route up into Preston. From here the crowds thickened again and I realised it was the famousegg rolling day in Avenham Park so it was simpler and safer to dismount and walk with the crowds. There was a great party atmosphere – egg-rollers, fair goers, music and dance entertainment and general family happiness. I tarried to absorb it all. Even after leaving the park the route through the docks was thronged with people, the steam train was running. I arrived back at the garage after three hours to collect my car, complete with its clinical diagnostic sheet. I complemented the receptionist on their efficiency and enthused how easily I fitted the cycle into the boot. Everyone seemed happy on this sunny Easter Monday. This entry was posted in Cycling, Family, Lancashire. and tagged Cycling, Lancashire, Preston, Preston Guild Wheel on April 19, 2017 by bowlandclimber. 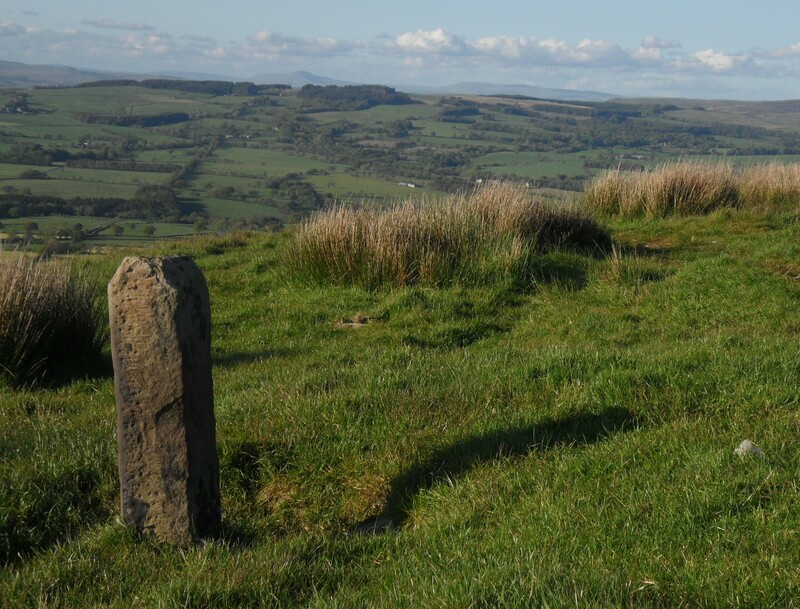 Longridge Fell – then and now. 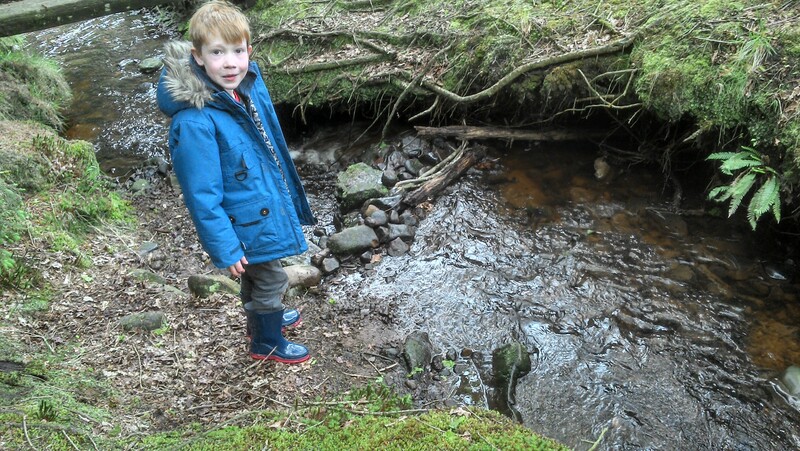 There is a stream coming off Longridge Fell crossed by a small bridge. I often walk this way. When my two oldest grand children were young this was an ideal spot for a bit of ‘damn building’ and became a favourite of theirs. This weekend I had staying my youngest grandchild and he was keen to follow suit. His father took a picture of us, then remembered back to previous times and low and behold there on his phone was April 2002. Uncanny coincidence. Wish I had evidence of visits with my boys when they were that young in the 70s. 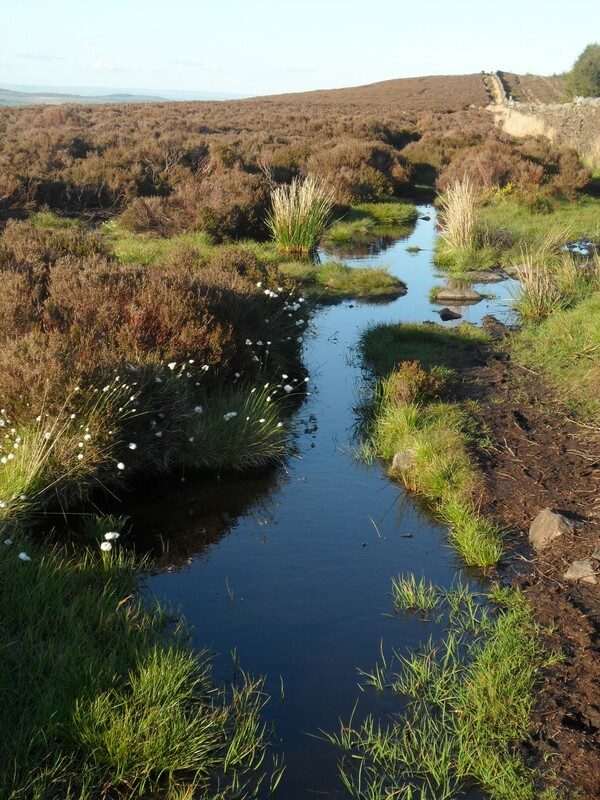 This entry was posted in Family, Longridge Fell, Walking. and tagged Longridge Fell, Walking. on April 18, 2016 by bowlandclimber. 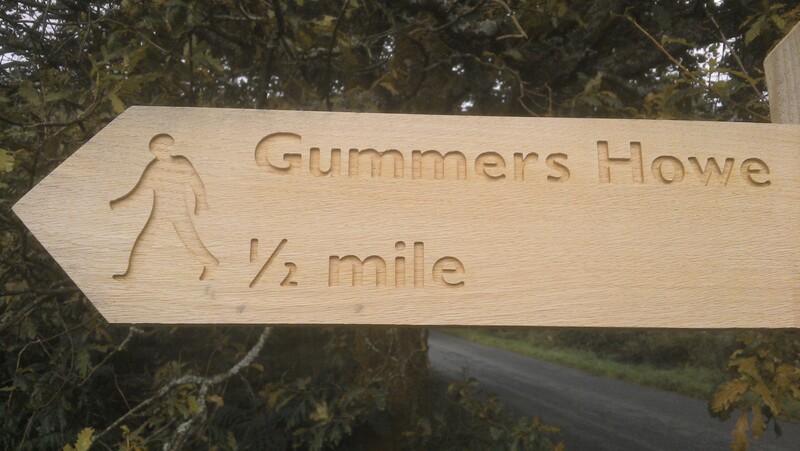 A QUICK LAKES VISIT – Gummers How. 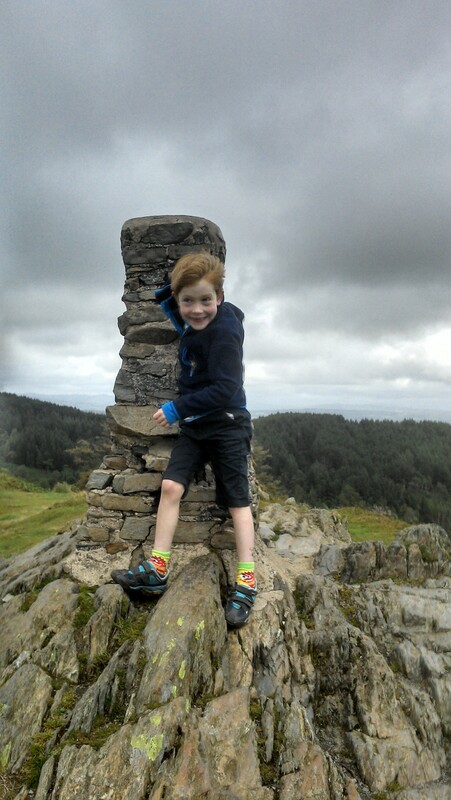 My son and grandson are camping in the Lakes this week. It has not been the best of summer weather but they have made the most of it. I arranged to join them this afternoon and drove up the motorway in low damp cloud, not exactly encouraging. 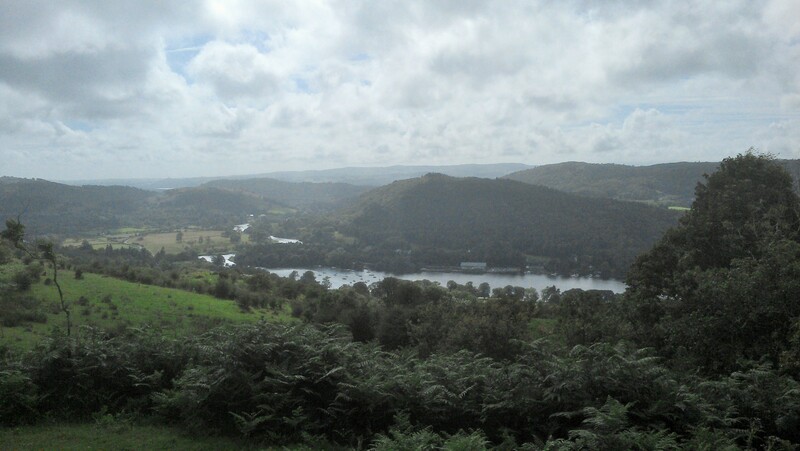 However when we met up at Newby Bridge there was a hint of brightness in the sky so I suggested a quick ascent of Gummers How nearby. This is a relatively low hill, 321m, and is made even easier by starting from Astley’s Plantation car park, itself at over 200 m. A Lakeland Fell in miniature. 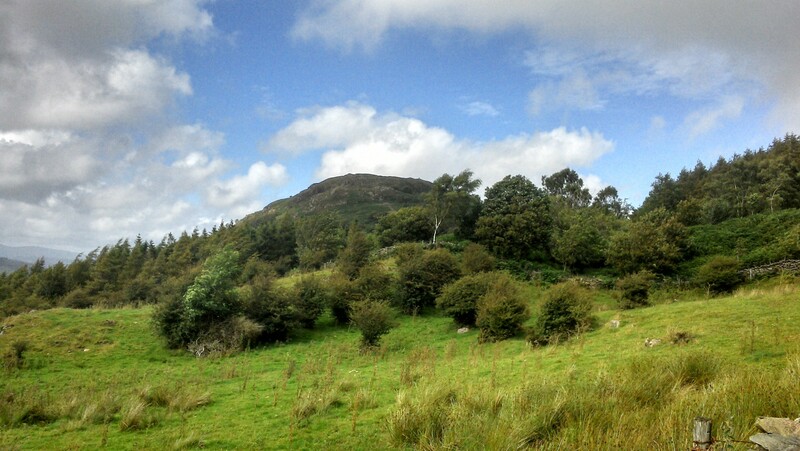 Wainwright included this summit in his Outlying Fells book – “it is an old man’s mountain, and when ancient legs can no longer climb it know ye that the sad day has come to hang up the boots for ever and take to slippers” So it was satisfying for our three generations to make the ascent together. In the trees low down the path was rather muddy probably due to the Luing cattle, imported to maintain a balanced flora. 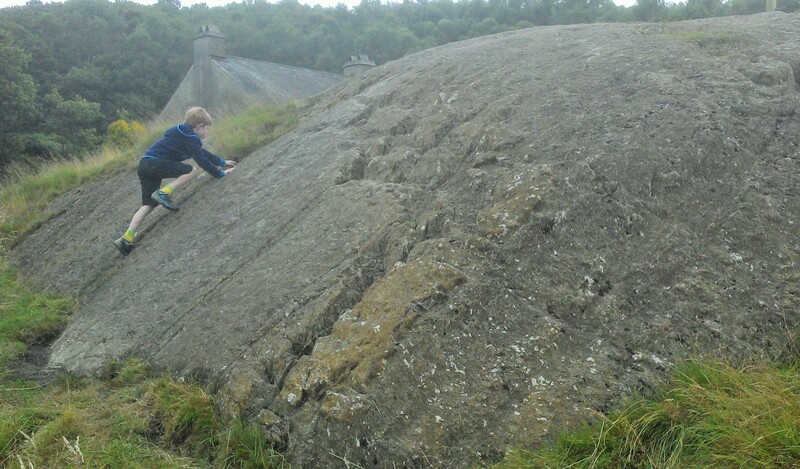 Higher the path has been stepped with Lakeland stone in parts and there are bits of scrambling to keep the youngster [and oldster] interested. Before long we were standing at the trig point in the strong wind. 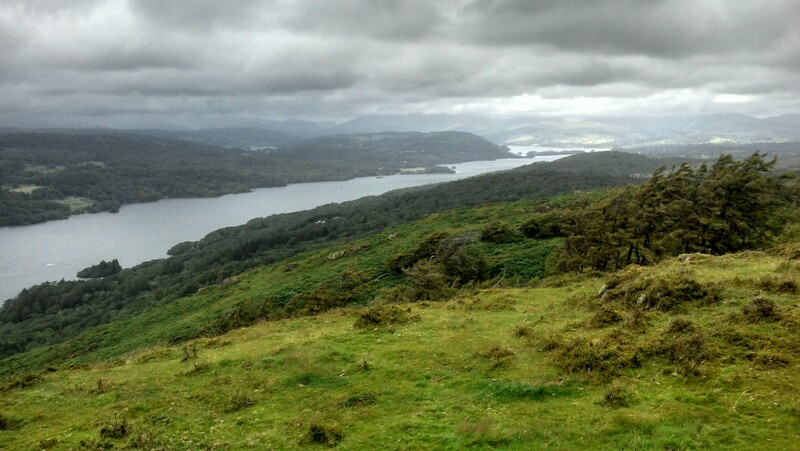 The celebrated views over Windermere were there but with overhead cloud. Coming down we found a different way through trees which were made for climbing especially if you are 7 year old. Back at the campsite there was more climbing on some glaciated boulders. The wind didn’t abate and it felt miserable, despite games of Frisbee, so I made my excuses and left them cooking supper. The joys of camping in an English summer. Back home to my slippers. 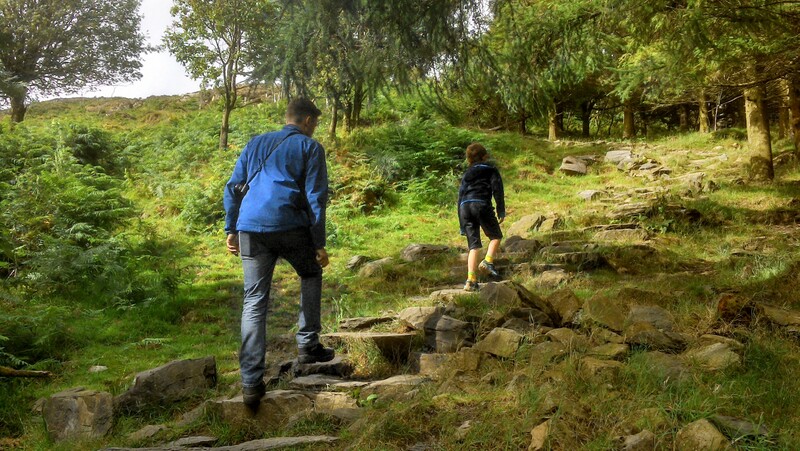 This entry was posted in Family, Lake District, Walking. and tagged Family, Lake District., Wainwright, Walking. on August 8, 2015 by bowlandclimber. Yes it’s June but one couldn’t be sure. 2nd. and we sailed pooh-sticks from a bridge on the turbulent Dean Brook at Hurst Green the next day All great fun and a great commune with nature. 3rd. At last today the wind has dropped and I’ve enjoyed a pleasant day. gardening has taken preference but by tea time I couldn’t resist a quick walk up Longridge Fell. Having parked at Cardwell House I took what I call the ‘balcony’ route onto the fell – it traverses above the Vale of Chipping with views to Fairsnape, round to The Trough of Bowland and the Three Yorkshire Peaks. Tonight was particularly clear. The path was wetter than I had expected and trainers were not the best footwear option. Leaving the trig point I cut through the trees to the southern side of the fell where the view over comparatively more industrial Lancashire was a contrast. Wind farms seem to be spreading – lets hope the same doesn’t happen on the Bowland Fells seen to the north. I heard that noted author, naturalist and environmentalist Robert Macfarlane was appearing on BBC’s Spring Watch Unsprung tonight. I was dismayed to find myself watching ‘Top Gear with Animals’ – the three presenters doing a good impersonation on a contrived set surrounded by an apparently amused audience. Not my idea of a nature presentation but maybe I’m out of date. Mr Macfarlane’s contribution was of little importance amongst the general hullabaloo. Shame. 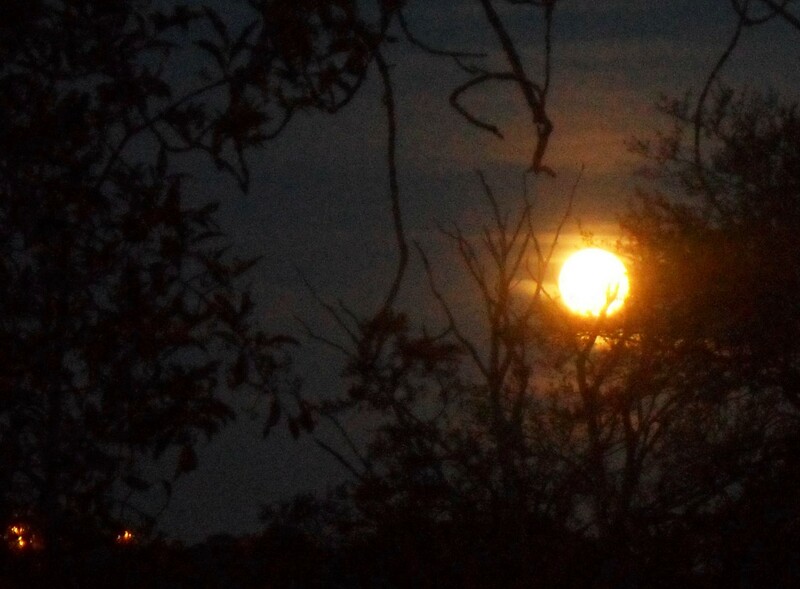 A beautiful moon seen from my room completed the evening and bodes well for an improving start to June. 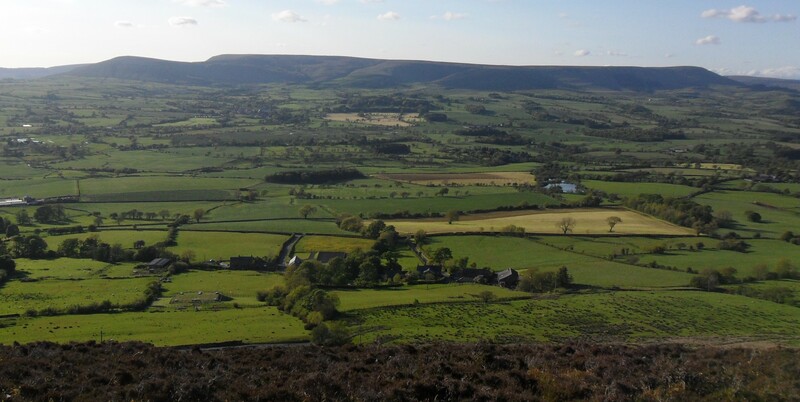 This entry was posted in Bowland Fells., Chipping Vale, Family, Longridge Fell, Walking. and tagged Bowland, Longridge Fell, Walking. on June 4, 2015 by bowlandclimber.